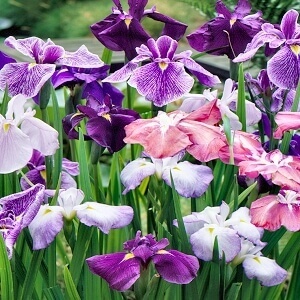 This is a gorgeous Iris that must have wet feet. Ideal for ponds, dams, water features and wet areas. It comes in six colours and flowers in summer. They are winter dormant. We have these as mixed plants only. Unfortunately over the years, the labels have faded, so we have each colour separate, but we don't know what colour it is. Their colours are; Red, Pink, Mauve, Blue, White and Purple. So to make sure you get a good mix, we are selling them in divisions with three shoots per division. You can order 3 divisions at $25 or 6 divisions at $50. Height to 1.2m, Width to 50cm, Frost tolerant.